No anime/manga post today as I remember the events of 9/11/2001. I have made a rather large post on my personal blog, which you can read there. God be with the friends and family of those who lost loved ones in this tragic event. I respectfully disagree with the characterization you provide. Saying any more would probably serve no useful purpose. 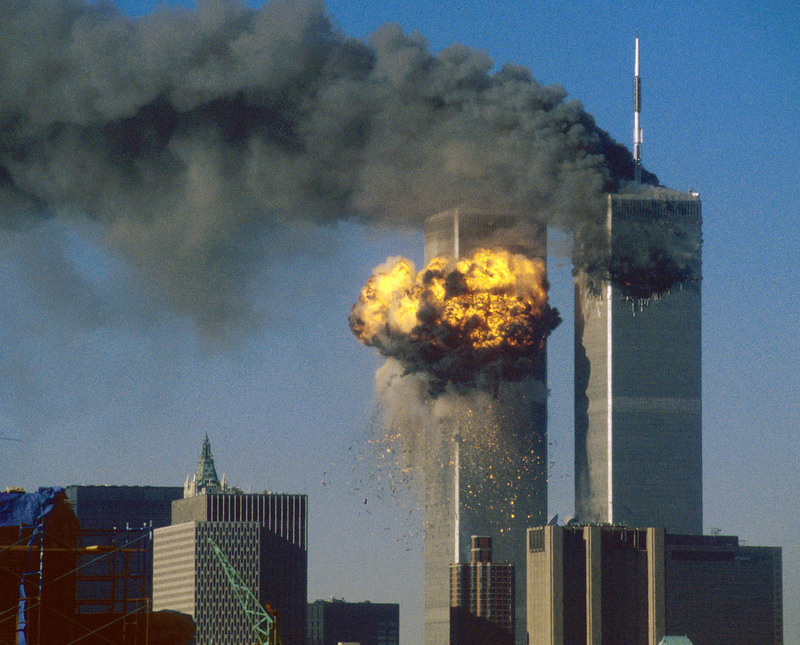 First of all, my heart goes out to everyone who have lost loved ones in the 9/11 tragedy and the wars we’ve had to fight against Islamic terrorists and their backers since then. You’re always in our prayers. That said, I have to comment on something that really irked me about your post. The rest of the post about how that day hit you was great by the way and very similar to my own experience. The thing is, I absolutely share your anger against the present day Islamofascists who attacked us, but I can’t believe you’re bringing up ancient history and calling 19th century high seas pirates “militant Muslims” in the present day sense. I’m sure you know Western nations including the US have engaged in state-sanctioned privateering, the same thing the Barbary Corsairs were doing back then. These sorts of things had nothing to do with religion and everything to do with ripping off whoever you could because you could. If anyone is following in the footsteps of the Barbary Corsairs, it’s the Somali pirates, not Al-Qaeda. Al-Qaeda are a very real threat to America, something these kinds of pirates have never been. Let’s keep these things in perspective. I’m sure you know Western nations including the US have engaged in state-sanctioned privateering, the same thing the Barbary Corsairs were doing back then. These sorts of things had nothing to do with religion and everything to do with ripping off whoever you could because you could. I did a report on this YEARS and years ago. Religion was very much a part of the equation. Jefferson, as Secretary of State, asked the Dey of Algiers Ambassador Ambassador Sidi Haji Abdul Rahman Adja why the Muslims were so hostile the U.S. when the U.S. had not done anything to them. The quote that is attributed to the ambassador says a lot. Back in the 80’s when I did this report (term paper is probably more accurate though I don’t think my teacher called it that), when we’d only just gotten over the Iranian hostage crisis and other terrorist events, this stuck out with me and explained why in 1983, our UNARMED, peacekeeper Marines were slaughtered by Islamic terrorist. Anyway, I remember that Jefferson bought his own Qur’an, read it on the sea voyage back home, and then wrote a letter President Washington, stating the U.S. would not be able to handle the problem diplomatically and rather than pay tribute, we would have to fight. Unfortunately, the decision was made to pay tribute. I think the term is “Jizya” which is a tax/ransom on non-Muslims if they want to continue living and not converting. I know Jizya mostly applies within Muslim states, but my understanding is that it can be used in a much broader sense, which apparently it was back in the late 1700’s. My point is that at that time in history, the Barbary Pirates were very much the Al-Qaeda of their day and even had the mighty British paying them tribute/ransom. For 25 (plus) years since I did that report in high school, I have been convinced that though the tactics have changed, the root of the problem is still the same. The justification for what they do is the same — the Qur’an gave them the right because we aren’t Muslims nor an Islamic state. Thanks for writing this. I wanted to write something in the same vein but sat on the fence too long about if I wanted to write something even remotely political to do so in time. I think just because Americans have the habit of not dwelling on history, it doesn’t mean other cultures act the same. The two big divisions of Islam clash over something that happened almost 1400 years ago, for example – what’s a couple centuries. And I’ve always thought that the terrorists decided on 9/11 as the date for the attacks because that was the date of the Battle of Vienna which in 1683 saw the Ottoman Empire finally checked in their ambition to control Europe and started the slow decline of Islamic power. Correct me if I’m wrong, but in your post, you seem to hold anger for the whole of the Muslim population. Even though it is only a small amount of Muslims that attack and terrorise the world. I don’t support their actions, but remember the innocent Muslims who probably hold contempt, or outright hate for the actions of these, as you put it, bastards. I had an argument with someone, about people who posted ‘Kill all Muslims’ on Facebook on Sunday. It’s the wrong approach, quite obviously. It is also not a good approach to generalise Muslims to be all terrorists. (Again, this is what I received from your post). Why continue a war? God, Allah, Buddha and whatver deity you deign to believe in, knows that our society is incredibly gun happy and violent. Violence begets violence. No offense man, but you seem to be yet another natural fanatic who, if you’d been born in the Middle East instead of America, would probably be a member of Al Qaida right now. You certainly make as much sense as they do. I don’t hate America, but all things considered I think America with its current mentality is a bigger threat to the world than Muslim terrorists are. Actually I shouldn’t say “America” as I know most people there are rational and well-meaning. I mean your corrupt corporate government and fanatics like you who cheer as they roll the war machine in the name of “protecting American lives”. And I’ve always thought that the terrorists decided on 9/11 as the date for the attacks because that was the date of the Battle of Vienna which in 1683 saw the Ottoman Empire finally checked in their ambition to control Europe and started the slow decline of Islamic power. Hmmmm…that is interesting. I hadn’t realized the dates were the same. You might well be right. Correct me if I’m wrong, but in your post, you seem to hold anger for the whole of the Muslim population. Nope, not at all. Just those who want hold the “convert or die” mentality. Even though it is only a small amount of Muslims that attack and terrorise the world. Well, it is a small number that actually do the labor, but the numbers that support those who attack and terrorize is much higher. Some of the biggest Islamic religious leaders in the Middle East, who have millions of followers, are all down for what the terrorist do. All they have to do is issue a religious decree and say that it is a religious duty to kill infidels and the killings will start immediately. In the U.S., we have multiple religions, including Islam. We don’t have state sponsored religion. None of the big religious leaders in the U.S. would ever issue some decree to kill non-believers. Indeed, even if they did such a thing, their followers would likely revolt against something so completely against the Bible. I don’t support their actions, but remember the innocent Muslims who probably hold contempt, or outright hate for the actions of these, as you put it, bastards. There are some of these, but for the most part, do you see them rising up to decry militant Islam? Maybe they don’t because they are afraid they would be killed if they spoke out. Maybe they don’t because while they may not approve of the method, they may decide that the ends may justify the means. The thing is, I don’t see Muslims in the U.S. or anywhere else protesting terrorism in the name of Islam. It is also not a good approach to generalise Muslims to be all terrorists. (Again, this is what I received from your post). No, its not and I’m not saying round up all Muslims like FDR did to the Japanese in the U.S. during World War II. However, there’s a major difference between the Islamic faith and other religions — there is no tolerance for other religions in Islam unless they pay a tax to the Muslims for the privilege to live as an infidel. Other major religions tend to have a “live and let live” attitude toward religions different than theirs in this day and age. Why continue a war? God, Allah, Buddha and whatver deity you deign to believe in, knows that our society is incredibly gun happy and violent. Violence begets violence. You shouldn’t continue a war if you aren’t going to win it. Revolutionary War — U.S. defeats the British. They back down for a time. First Barbary War — U.S. defeats Algiers and the Barbary Pirates. They back down for a time. War of 1812 — British decide to go against the U.S. again and their second defeat started the U.S. and Great Britain on the path to strong allies. Second Barbary War — U.S. again defeats Algiers and solves the Muslim problem against U.S. interests for many years. Civil War — Though incorrectly named today (since the South wasn’t interested in taking over the U.S. government but rather forming their own country), the result of the Civil War finally ended slavery and brought the country together. World War I — The U.S. won with its allies, though the aftermath was handled poorly. World War II — Again, the U.S. won, utterly defeating the Germans and then the Japanese. The Japanese were pretty fanatical in their fight because the Emperor was a deity to them and thus if your god says, “fight to the death,” that’s what you do. That’s why at the end of hostilities with Japan, we had the Emperor renounce his divinity. In the aftermath of WWII, both Germany and Japan became good allies with the U.S. My grandparents had negative views of both Germany and Japan because of their experiences in the War. That’s understandable. However, because we fought to win and then didn’t screw over the population afterward, my generation and beyond don’t know a world were Germany or Japan were enemies. Korea — This is the first war where the U.S. didn’t fight with everything it had. We had the North Koreans defeated but then China came in and pushed us back. We then had China on the run and then quit because of fear that the Soviets would get involved and we’d have World War III. So instead, we opted for decades of living in fear and to this day, North Korea is a thorn in our side. Vietnam War — This is another war where the U.S. refused to fight properly out of fear of being called the villains and the fear of the Soviets. The result was years of conflict with nothing served. Persian Gulf War — This is a war where we kick Iraq out of Kuwait, but then refuse to completely defeat Iraq out of fear of what the Islamic states would say and out of fear that the press would lable us the villains. War in Afghanistan — We go to war to wipe out terrorist camps and change the political leadership in the country. However, we hold back to prevent being branded by the press as the villains (and whatever other reasons there were). When we finally had a surge, we did get an upper hand but we still didn’t do everything we could to wipe out the terrorist (those lovely rules of engagement). Iraq War — Whether justified or not, we went in full bore, then backed off and allowed a nasty element to rise up. We sent in more troops to get a handle of the situation but we never took out those responsible for the troubles and we are still there. When it comes to military action, you either let them do what they do best or you don’t send them into harm’s way. Playing politics with the military or going at things half-arsed to try to appear to be the “good guy” is not the way to go. The thing is, I don’t see Muslims in the U.S. or anywhere else protesting terrorism in the name of Islam. Type in “muslim terrorist condemnation” into Google and see what you get. No offense man, but you seem to be yet another natural fanatic who, if you’d been born in the Middle East instead of America, would probably be a member of Al Qaida right now. No, I’m not a fanatic but I think if we were BOTH born in the Middle East, we’d be faithful Muslims and when our Imam says, “protest and shout ‘Death to America,’ we’d be out there doing it because we’d be honoring Allah. I don’t hate America, but all things considered I think America with its current mentality is a bigger threat to the world than Muslim terrorists are. Actually I shouldn’t say “America” as I know most people there are rational and well-meaning. I mean your corrupt corporate government and fanatics like you who cheer as they roll the war machine in the name of “protecting American lives”. There’s no doubt the government is fairly corrupt. We’ve developed a ruling elite of both Republicans and Democrats in Washington D.C. who become addicted to the power and love the money that rolls into them from special interest groups. We’ve developed a “crony capitalist” system, which is why a company like G.E. doesn’t pay any U.S. taxes. However, the head of the company supports the “correct” causes and politicians and so is on the President’s job’s panel (or whatever its called) and is heralded as a good CEO while he outsources jobs and lowers the total number of people his company employes. Our government is filled with elected people who suddenly become an expert on everything because they are now a Senator, Congressman, or President. Our government passes an insane number of laws every year just so they can say “we did something” rather than enforce the laws already on the book. Our leaders feel they should decide the winners and losers in life. They feel they should micromanage people’s lives because that will eventually lead to utopia — Heaven on Earth. That being said, if our president says, “we are fighting a war in such-and-such a place and here’s why,” then sure, I’ll support my president. However, if we are going to use our military, then we should let the dogs off the leash. You have to completely and utterly defeat your opponent. Then, once defeated, you can help them rebuild, as we did after World War II for Germany, Italy, and Japan. However, if the military is to be used in a half-arsed way out of fear of what the press or others might say which would make it appear we are the villains, then there’s NO reason to send them into harm’s way. They just stand watch and protect us against those who would attack us and do us harm. I’ve had friends and the children of friends sent to both Iraq and Afghanistan. I’ve been fortunate that none of them lost their lives. Unfortunately, in both wars, I feel we didn’t fight them properly and so the years have passed on with what? The reason President Obama hasn’t been in a hurry to get the troops out is because I’m sure he knows what will happen as soon as we are gone — things will go back to the way they were or WORSE. Why? Because we didn’t do the job we should have done and so likely, we’ll have two more wastes of time and energy. If you’re going to complain about how Muslims haven’t strongly denounced bin Laden and his ilk, think about why America sides with the Saudi regime even though what they stand for is in total contradiction with American values. It’s the “they may be assholes, but they’re OUR assholes” principle at work. I’ve talked to quite a few people who’d condemn Abu Ghraib abuses on general principle, but nevertheless would excuse the perpetrators because they hold a grudge for 9/11. Many Muslims hold a grudge against the US for our government’s activities in the Middle East (including pre-9/11) and in all honesty they do have a point. Whenever people start thinking in terms of “us” vs “them”, normal moral considerations are often ignored. That doesn’t mean they don’t exist. I could add ‘how many groups condemning terrorism refuse to condemn terrorism committed against Israel’ but that is a different topic. There are plenty of moderate Muslims in the world. Michael Totten has met many of them. Most Iranians are moderate or even liberal because they had to live under extremists and learn the hard way. Likewise, most Indonesians and Bosnians would extremely moderate even by Western standards. But most of the organizations, groups, and spokesmen who most often are seen and proclaim themselves as the face of Islam are not. They sometimes have the appearance of moderation, but you look at their rhetoric when talking among themselves, other like-minded people and groups, and sometimes to outsiders (Witness Hebollah’s leader saying when they attack you, they are trying to destroy you, not get you to negotiate with them. ), and you realize they are not. It is troubling that the moderate Muslims can not sideline these groups like CAIR and replace them with truly moderate representatives. It is troubling that we have leaders in the West who can embrace these radical groups as representatives of a religion while labeling those who dare call them by what they are – extremists – as Islam-phobes or racist. That is a widespread problem in the US which transcends political parties. If moderate Muslims want to be acknowledged as the true face of Islam, they had better start ostracizing the radicals from their midsts. You are not going to get many people to agree with you when your fellow co-religionists hold up signs that says ‘Behead those who Say Islam is Violent’ or think, by 2-to-1 or greater majorities, that Muslims did not do 9-11. BTW, like ANB said, I do not blindly support any ‘war machine’ (For an imperialistic war machine, the US seems to have done a lousy job of silencing its critics.) nor do I believe the US should get into a war without going all out, for victory. I do support the US going to war to defend itself, people, its allies, and its interests, especially when the groups attacking us are so beyond the pale that they are willing to kill people because they are not right ‘Muslim’, are homosexual, or because somewhere in the world, a nation has banned the hijab from their public schools. A guy at an anime blog I read makes a great point in his 9/11 post about how history teaches us that militant Muslims have always hated America, even when we’d just gained our independence. I had no idea it went back that far until I read the facts he laid out. I’m not going to comment on whether the Quran actually condones piracy or whether the Algerian ambassador quoted is simply full of it (I’m suspecting some selective interpretation to support imperialism-like practices), but I don’t see any substantial link between 18th/early 19th century Barbary Corsairs and modern Islamic militism. The poster’s narrow focus prevents him seeing that the forces driving the piracy and terrorism are very different. The Barbary Corsairs would of course be driven by a profit motive. Unlike American slave populations, slave populations in muslim countries did not grow rapidly, because the Quran encourages slaveholders to free their slaves as an act of charity. Which of course ends up driving demand for new slaves. American ships would have been one of many targets. Storming of American embassy in Iran: a response to America allowing the disposed Shah (a corrupt and much hated dictator the US had previously supported) into the US for medical treatment. Beiruit barracks bombing: occurred shortly after the US Navy provided fire support for a faction in the Lebanese Civil War. The commander of the peacekeeping unit that was targeted actually predicted that his unit might be the target of such a reprisal, since it ended the US’s image as a neutral party in that war. 9/11 itself is a bit more complicated. Bin Laden mentioned the bombing of Beirut by Israel (an American ally) as a formative moment, however, his big vendetta was against the Saudi government, who he considered massively corrupt. And he also considered breaking American economic supremacy essential to ending corrupt regimes in Saudi Arabia and other muslim countries. I’d probably cite Bin Laden’s hatred of the Saudi government as his primary reason for singling out the US, as the conduct of countries like Russia and India (both also hated by muslim militants) towards their muslim populations has been much worse than anything the US has been directly involved in. I mention this not to try and vindicate Islamic militarism, but because I think that understanding its driving forces is essential to preventing its spread. The strategy the US pursued after 9/11 has been a mistake in this regard, as it played directly into the narrative that muslim extremists use to generate hate towards the US. The US’s support for certain (often corrupt) governments in the muslim world has often seen as a self interested move – one of Bin Laden’s talking points was that the Saudi government was giving America its oil for a pittance compared to its real worth (the math involved was pretty ludicrous, of course). So sending troops into two oil rich countries (Afghanistan is important to several oil pipeline projects) in response to an attack that many muslims see as either the action of a madman or even a false flag operation (Americans are not the only ones who have 9/11 conspiracies, apparently) wasn’t good PR by any stretch of the imagination. In fact, it played right into the narrative of the world promoted by militant groups. Some of what I’ve read suggest it wasn’t always this way, with many muslims actually having a favourable opinion of America just after World War II – in large part because America was seen as different from the colonialist European powers. It was only later that the associated between America and corrupt regimes started to take route. Tl;DR: The piracy phenomenon was driven by profit, modern day hatred of America among muslims by conditions in muslim countries and perceived American involvement in those conditions. There is no 200+ year hatred towards America among muslims. The Barbary Pirates had been ravaging the mediterranean for centuries, and pretty much attacked anyone they liked, except for their “patrons”, namely the Ottoman Empire. The Pirates had no axe to grind against the USA, they were just another target. The main reason that the US had such trouble with the Pirates was because they were no longer bound by treaties that Britain had signed with them, and also no longer protected by Britain’s extremely large fleet. Consequently their shipping was rendered newly vulnerable, necessitating the war the US fought against them. What really finally put the piracy to an end was France’s conquest of Algiers, along with the rest of north africa coming under the control of European powers. Unfortunately, “freedom” has become the term associated with being a non-islamic state. Anyway, this brought back so many memories. The 1st half of the day was blurry as that was a school day for many of the youth. After I got home, I was on the television hoping to watch my favorite program on tv. However, the attacks had so much coverage that the information was practically at a standstill. This continued for at least a week before the reports started fading away. Now that I reflect upon it, there was no way that I knew what was going on (as I was 10 back then) and there were many people that felt that way too. Now, its in our history textbooks as a major event – in the psychological standpoint from us. Everyone does understand that Bin Laden was tossing out a laundry list of grievances against the US and the West, right? That US support for the government of Saudi Arabia and having bases there was only 2 of them? If we wanted to truly appease Bin Laden and Al Qaeda by tackling the items on his laundry list, that would require, among others, giving most Spain back to the Moors and treating women the same way women were treating by the Taliban or Shabaab. Even mild actions that went against radical Islam, like France deciding that the hijab was not acceptable at its public schools, caused the Muslim extremists to go insane. Trying to reason with people like that is worst than useless since it will bring no gratitude whatsoever, but will simply lead to more demands until they will demand for something you can’t give. It’s like the neighborhood bully terrorizing the local children, except less funny and more deadly. For anyone interested, I recommend reading “The Real Roots of Arab Antimamericanism,” written by Barry Rubin and published in November/December 2002 issue of Foreign Affairs. You can find a copy of the article at the link below. If you’re going to complain about how Muslims haven’t strongly denounced bin Laden and his ilk, think about why America sides with the Saudi regime even though what they stand for is in total contradiction with American values. But there have been those with power (elected leaders) who’ve spoken out against them on the American side. It’s the “they may be assholes, but they’re OUR assholes” principle at work. I agree that this tends to be a tendency and it is one that I used to agree with. Why? Because with the Shah or other Middle Easter dictator, they kept the Communist or militant Muslim aspects which were a threat to the U.S. at bay. We were using them as a sort of shield and picking the lesser of two evils. Today, I’m no longer down with that philosophy would opt for leave them alone but if they try to do something against us, we blow them to hell and then leave again. It is troubling that the moderate Muslims can not sideline these groups like CAIR and replace them with truly moderate representatives. CAIR is certainly a bad organization, IMO. It is troubling that we have leaders in the West who can embrace these radical groups as representatives of a religion while labeling those who dare call them by what they are – extremists – as Islam-phobes or racist. That is a widespread problem in the US which transcends political parties. I agree. The problem is that these “leaders” think they can negotiate with the radical groups. President Washington did back in the Barbary Pirate days. Jefferson realized they couldn’t be bought or negotiated with but had to be defeated and that’s why our foreign policy changed when he was elected President. Basically, we ignore history and come up with excuses for ignoring it rather than see the connections because it isn’t comfortable seeing things for what they are. Unfortunately, “freedom” has become the term associated with being a non-islamic state. Well, Islamic states aren’t any more free than they were before the militants took over. If anything, things are worse. That’s just weak, bro. This was already pointed out to you, I might add, so continuing to feign ignorance is dubious at best. Even though readers should take Strategy Page with a gain of salt in many of their articles, this is another link people might be interested in. Likewise, if France, despite all their efforts to curry favor by appeasing the expectations of the Muslim/Arab world, got precious little for her efforts, explain how the US could have done better. That was a good writeup about your experiences ANB. Not going to argue about the Muslims because people tend to have deeply entrenched views about that, but I just wanted to say that you as a Ryoko fan talking about AlQaeda made me think of good name for rabid Ryoko fans: RyoQaeda. Not including you in that of course ANB, you’re a normal fan and not hysterical about her like some people (*cough*Tenchiforum*cough*). Yeah, and they are so loud and out there on the streets demanding militant Islam step back. They are on TV constantly denouncing militant Islam and are the face of Islam. The loudest voices, and the ones that carry the most weight, are the militant Islamic religious leaders and their followers. As Salman Rushdie discovered, you don’t say anything negative about Islam. He rights a book and there are riots and a death fatwā on his head. A cartoonist draws Mohammad and there are massive riots over it. We couldn’t have. And its not just France. Great Britain and much of Europe is learning the hard way that appeasing to Muslim demands and multiculturalism have failed. France has entire streets shut down because the Muslims take to the streets for prayers and the police are too afraid to do anything (or are ordered not to do anything from those afraid to put an end to this activity, even though it is illegal under French law). It amazes me. No other religion can get away with as much as Islam can and its because there are people afraid of being called Islomophobic. That was a good writeup about your experiences ANB. Not going to argue about the Muslims because people tend to have deeply entrenched views about that, but I just wanted to say that you as a Ryoko fan talking about AlQaeda made me think of good name for rabid Ryoko fans: RyoQaeda. Not including you in that of course ANB, you’re a normal fan and not hysterical about her like some people (*cough*Tenchiforum*cough*). You don’t have to keep posting, we all got that you don’t like Muslims. Yeah, let’s claim that people aren’t doing something and when it’s shown that they are doing it then let’s fall back to how they’re not doing enough or aren’t really sincere about it. There are more than a billion Muslims in the world, but let’s paint them all with the same broad and biased brush because we know that Christians have uniform views on everything and there aren’t any nutty militia in the woods piling assault weapons and fertilizer. The world is just a teeny bit more complex than what Fox News tells you, and I’ll eat my hat if you’re not a regular viewer of theirs. And to think that I clicked on this link because I thought I could join you in a moment of silence for the victims of 9/11… It’s great to know that your fellow anime fans will always distrust and fear you just because your holy book differs from theirs. I got so upset that I completely forgot to thank the posters who tried to correct the bigoted views expressed here. Thanks guys!